Buzz Williams wasn’t sure Jake Thomas was going to play Thursday against Georgetown. The redshirt senior had suffered a slight shoulder separation in Saturday’s win over DePaul, missed practice Monday and had a bruise that looked “like someone threw a softball at close range at 80 miles per hour” at it, forcing him to wear a shooting sleeve for the first time. Thomas played, and he played as well as ever. He dropped a Marquette career-best 22 points, including 6-for-9 shooting from beyond the arc, in Marquette’s 75-73 win, moving the Golden Eagles one step closer to finding themselves on the bubble of NCAA Tournament talk. It didn’t take long for Thomas to get going. He came around a screen on Marquette’s first possession and connected on a 3-pointer to give Marquette an early lead. And while that didn’t translate to the Marquette offense getting off to a fast start, it foreshadowed a solid outing coming from Thomas. Thomas has made his first 3-pointer in nine conference games. In those games, he has made 31 of 64 attempts from beyond the arc (48.4 percent) – and that includes a 1-for-8 performance at Butler last month. 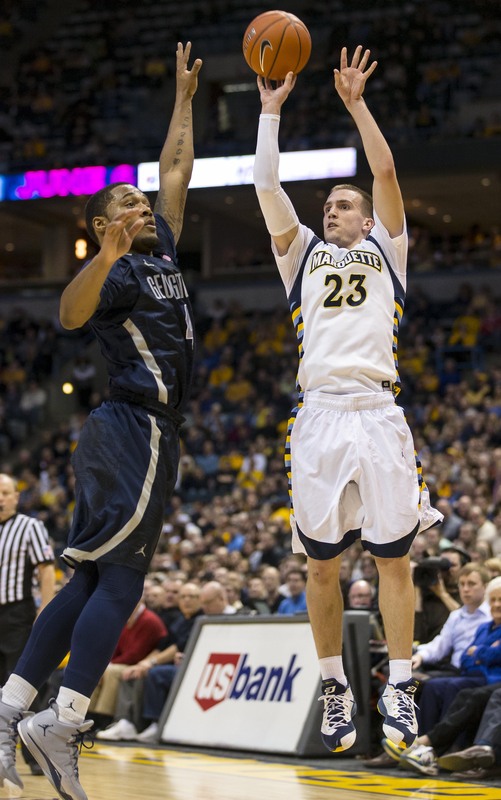 In Marquette’s other six contests, he’s just 5-for-26 (19.2 percent), so hitting that first 3-pointer was good news. Thomas connected on his second 3 of the evening during a 9-2 run midway through the half that helped pull Marquette closer after the putrid start that saw them miss nine of 12 shots between Thomas long-range makes. He even added a transition layup – his seventh two-point field goal of the year – and gave Marquette its first lead, 27-26, since the opening minutes with his third 3-pointer. His fourth 3-pointer came in the midst of an 8-1 run to open the second half, which pushed Marquette’s lead to five, 45-41. After Thomas cleared himself for practice Tuesday, Williams opted to make him the focal point of his newest inbounds play. The Marquette coaching staff had seen a variation of Georgetown’s zone defense it felt it could take advantage of, and Thomas was just the man to do it. So the Golden Eagles installed the play Wednesday, an example that Williams referred to as a “right-now basket.” They ran it once in shootaround Wednesday, and Williams opted to run it while Marquette was hot. Thomas came from the baseline around a screen from John Dawson and was left wide open on the wing, knocking down his fifth 3-pointer and gave Marquette its biggest lead of the night, 48-41. And as the ball went through the net, Thomas turned to a celebrating Marquette bench and yelled that the shot went in, directing his words at the Marquette assistants who were joking that the pass from Mayo came late. In the confusion, official Ed Corbett apparently thought Thomas was directing his words at Georgetown forward Jabril Trawick, and issued Thomas a technical foul for taunting. Just two minutes later, however, Thomas got his revenge. Trawick was called for a technical foul in the middle of a Marquette possession, and it was ironically Thomas who took, and made, both technical free throw attempts. Those free throws were Thomas’ 18th and 19th points, which gave him a new career-high, surpassing the 18 points he scored a few weeks earlier against Xavier. Thomas added a sixth 3-pointer, tying his career-high, minutes later to push Marquette’s lead to seven, 63-56, and stopped a quick 4-0 Georgetown run. Davante Gardner, who finished with a game-high 26 points, took care of the rest down the stretch, scoring 11 points in the final 6:29 to get Marquette back to third place in the Big East. Part of Gardner’s dominance came in part because of what Thomas had done the first 34 minutes of the game. Not once did Georgetown double-team Gardner in the post, allowing the Golden Eagles’ top big man freedom to go work against little-used Bradley Hayes, who saw extended minutes after Nate Lubick and Moses Ayegba fouled out; Mikael Hopkins battled foul trouble all night, too. Six 3-pointers and a new career-high from Thomas may have been the reason why. All his offensive accolades likely will overshadow the defensive job he did on Markel Starks and D’Vauntes Smith-Rivera, specifically in the final minutes of the game. And for those who may wonder why Thomas receives the minutes he does, the trust Williams has in his players bleeds through whenever he begins talking about Thomas. The suddenly efficient Thomas – on both ends of the floor – has now averaged 14.5 points in his last four games, and has made 15 of 29 shots from beyond the arc. If Marquette is going to make a run in its final three regular season games, it’ll need more scoring from the player who’s suddenly one of the hottest shooters in the Big East. And as for the technical, it’ll likely be the soft-spoken Thomas’ last. But surprisingly, it wasn’t his first. Thomas admitted he picked up a technical foul at South Dakota in 2010 for hanging on the rim after a dunk. 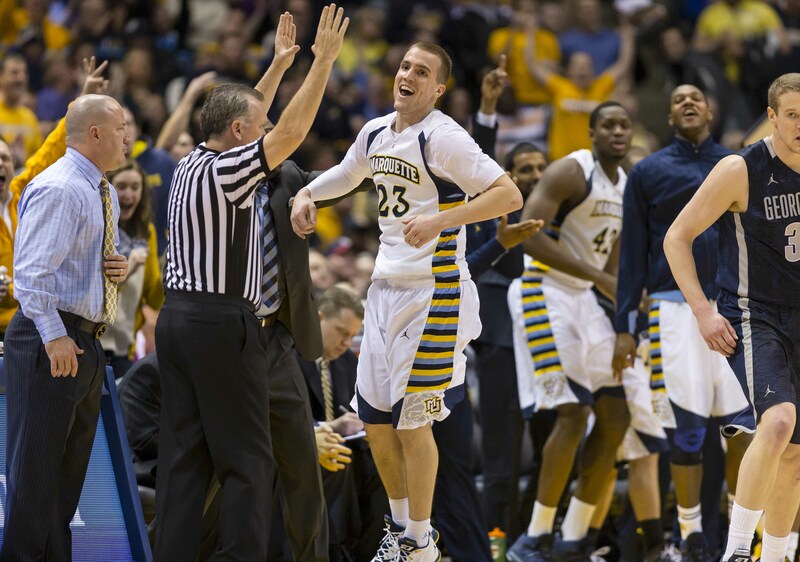 South Dakota won that game, just like Marquette did Thursday night. isn’t Jake’s 10 3’s while at USD technically his “career high” or do we not even consider that anymore?